Tuesdays & Wednesdays at 10:30 a.m.
Storytime at the Lake Tahoe Branch at Zephyr Cove is for children of all ages. A fun craft is included. Storytime programs are seasonal; please check the Library Calendar or contact the library for detailed information. Every Thursday between 3:30 and 5:30 p.m.
Children of all ages and reading levels are invited to read with a registered therapy dog and the dog's handler. Each child will spend 15 minutes with a dog. Time slots are available on a first come, first serve basis. Parental permission is required, and permission forms are available at the library. 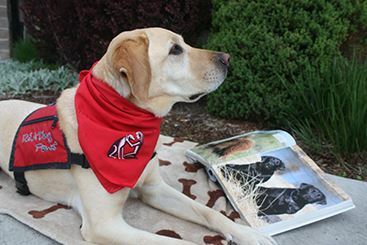 This program is offered in partnership with READing Paws, a local affiliate of Intermountain Therapy Animals. We purchase many high-quality resources to help you with online research. They are part of our Digital Branch, available from your home 24/7. To use these resources from outside the library, you will be prompted to enter the number on the back of your library card along with your account password. If you need help using these resources, please contact the library when we are open at 775-782-9841. The library has Leveled Readers. Reading levels and points for both Reading Counts and Accelerated Reader programs are noted inside most of our children's books. For classes in Douglas County who cannot come to the library due to transportation issues, etc., staff visits can bring the library to your students. Librarians will provide age-appropriate library information and materials, read stories and encourage students to use the library. Please call 775-782-9841 to make arrangements. Please call as far in advance as possible to schedule a class or group visit to the library.